In a bold move that surprised even constitutional scholars, the U.S. Supreme Court ruled on Jan. 21 that that the government may not ban political spending by corporations in federal elections. Emory constitutional law specialists and political scientists say that the full impact of the decision on the electoral system may not be known for years, but most believe that the decision, Citizens United vs. the Federal Elections Commissions (FEC), will ultimately serve to increase the influence of business on the political process. "The doctrinal implications of Citizen United could be profound," says Michael Kang, a professor at Emory's School of Law who specializes in constitutional electoral issues. "But it's unclear that the decision will lead to a huge change in campaign spending over the short term." The high court, in a narrow 5-4 ruling, sided with the plaintiff, Citizens United, a conservative nonprofit corporation that challenged the FEC's decision to block the video-on-demand broadcast of a 90-minute film, Hillary: The Movie, within 30 days of the 2008 presidential primary elections. A vehicle of biting political commentary and advocacy journalism, the film was originally released in January 2008. Citizens United argued that FEC's block amounted to censorship of its First Amendment right to free speech. I do not believe that this opinion in one stroke returns us to the 1906 trust situation. Many politicians, including President Barack Obama, reacted angrily to the ruling. "Last week, the Supreme Court reversed a century of law to open the floodgates for special interests — including foreign companies — to spend without limit in our elections," Obama said in his State of the Union address on Jan. 27. "Well, I don't think American elections should be bankrolled by America's most powerful interests, and worse, by foreign entities. They should be decided by the American people, and that's why I'm urging Democrats and Republicans to pass a bill that helps to right this wrong." Justice Samuel Alito Jr., one of the majority, shook his head "no" during the president's speech, presumably signifying that he disagrees with Obama's interpretation of the ruling, which held with Citizens United that corporations—considered by the court to be associations of individuals—should have the same right to free speech as individuals. Some Emory scholars say Alito had more of the facts on his side. "It's a real stretch," says Charles Shanor, a constitutional law specialist at Emory's School of Law, of Obama's assertion that it takes the country back to the late 19th century, robber baron era when vast corporate trusts wielded tremendous power. "I do not believe that this opinion in one stroke returns us to the 1906 trust situation." The conservative majority on the court is taking it upon itself to reverse the considered judgment of the elected branches. Alan Abramowitz, professor of political science, disagrees. He calls the ruling "a radical decision overturning decades of settled law" and "a clear example of judicial activism. He points out that "the conservative majority on the court is taking it upon itself to reverse the considered judgment of the elected branches. And it is doing so not in the interest of protecting some disadvantaged minority, as was the case with some of the decisions of earlier courts in the area of civil rights, but in the interest of protecting one of the most advantaged groups in American society—large corporations." Shanor, on the other hand, believes Obama is wrong on his second point as well: that Congress can do something to reverse the ruling. "The kind of political response of the president and a number of others doesn't do anything to reverse a Supreme Court decision. 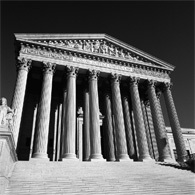 It may garner support amongst constituents, but the Supreme Court is relatively immune to that." Instead, Shanor says, Congress could focus on requirements for greater disclosure, giving voters more idea of who is funding what. He noted that in Citizens United, only Justice Clarence Thomas believed that such disclosures were unconstitutional. "I really think that the political actors in some ways ought to look at this as an opportunity and a challenge to reinvent the types of controls that are still feasible after this opinion, which to me are disclosure and anti-corruption measures," Shanor says. One such proposal now on the table would require the disclosure of campaign contributions to shareholders, as the British do. Another possibility to boost individual's access to power: a $50 to $100 tax credit to individuals who make contributions. Shanor believes there is no need to be overly concerned about companies gaining more power over the electoral process as a result of this decision. Eventually, he says, the government will make regulatory adjustments that will likely prevent companies from gaining more influence in the system. "Things will happen to keep the system in balance," he predicts. The decision overruled a portion of the 2002 McCain-Feingold Act that banned companies from broadcasting ads less than 60 days away from a general election or 30 days away from a presidential primary. It also overturned a 1990 decision, Austin v. Michigan Chamber of Commerce, which held the legality of government restrictions on corporate spending in electoral politics, and a 2003 decision, McConnell v. Federal Election Commission, a ruling that upheld McCain-Feingold. Many legal scholars seem to agree with the court's interpretation on corporate First Amendment rights. "The First Amendment is fairly clear," says Paul Rubin, professor of law and economics. "It seems to me that it was a fairly straightforward decision." Ultimately, most Emory scholars interviewed believe that the decision may have less impact than some now expect. Bill Carney, the Charles Howard Candler Professor of Law, says he is glad to see this distinction between corporate and individual speech disappearing, because he never thought it had a principled basis. Abramowitz, however, believes that the distinction should be preserved, especially in the political process. "This is a distinction that has long been recognized by the courts and by Congress," he says. "Just because corporations have some rights to express political opinions doesn't mean they must have all of the same rights as real persons. After all, they can't vote. At least not yet." The ruling is expected to change politics, but few will venture a guess as to how. "I think most corporations are likely to focus most of their political activities directly on lobbying and/or advertising on issues they're directly concerned with rather than putting a lot of money into supporting or opposing candidates," says Abramowitz. Professors note that companies still have other pressures preventing them from supporting or speaking out against particular candidates, even without a law. First, investors and customers are likely to prevent most companies from becoming too ideological, professors say. "Corporations are in business — they don't want to alienate their customers," says Rubin. On the investor side too, professors say, why would investors want to see company funds spent on issues outside its own narrow, business-related concerns? Finally, there may not be more in the piggy bank where that came from. "I'm not convinced that either the companies or the unions have a lot of money that they are sitting on and not spending," says Tom Clark, professor of political science. Companies already spend a lot on politics. According to the Center for Responsive Politics (CRP), a nonpartisan advocacy group in Washington, D.C., that tracks federal political expenditures, in the last federal election cycle in 2008, a total of $5.2 billion from all sources was spent. Overall, business or business-related organizations already contribute much more to campaigns than organized labor, their nearest competitor. CRP estimates that in the 2007-2008 election cycle, they had roughly a 15-to-1 spending advantage — nearly $2 billion versus about $74 million for labor. But advocates for campaign spending restrictions are skeptical that these invisible hands will be enough to prevent companies and unions from finding a way to use the Supreme Court's decision to their advantage. "No one knows exactly how this will play out," says Sheila Krumholz, executive director of the CRP, in a recent statement submitted to the Senate Committee on Rules and Administration. "However," Krumholz continues, "over the course of our 26-year history of monitoring the confluence of money and politics, we have seen time and time again that corporations and unions have the appetite to use their financial largess to wield control over politics and elections. It stands to reason that some, if not many, organizations will take advantage of this new loophole." Legal professor Shanor argues that lifting the ban may ultimately make the source of contributions more transparent to voters. The political action committees used to fund many corporate political messages now are often given innocuous names and don't have to disclose their true ownership or purpose. If Congress strengthens disclosure laws in the wake of Citizens United, an advertisement that has the actual name of the oil company sponsoring the advertisement rather than "Citizens for Energy Independence," for instance, may carry a different weight with voters. For constitutional scholars, the decision also offers new clues as to the character of the still relatively young Roberts Court. Chief Justice John Roberts promised during his Senate confirmation hearings that he would not be an activist judge. However, in election law, he is proving to be much more active than the Court under Justice William Rehnquist, according to legal professor Kang. "The Roberts Court is very clearly rolling things back," he says. For those who don't like the trend, Shanor encourages patience. The margin for this decision was quite narrow — just a single vote. At 5-4, Shanor notes, just one death or retirement from the bench could flip the balance substantially.